Higher level of integration plus 45nm manufacturing enables significant power reduction, performance improvements and smaller package size. Average power consumption down 20 percent over previous generation, enabling longer battery life in netbooks. Over 80 netbook design wins from major OEMs including ASUS, Acer, Dell, Toshiba, Fujitsu, Lenovo, Samsung and MSI. Next-generation Intel® Atom™ systems available Jan. 4. SANTA CLARA, Calif., Dec 21, 2009 – Intel Corporation announced new Intel Atom processors today that feature integrated graphics built directly into the CPU, enabling improved performance and smaller, more energy- efficient designs in a new generation of netbooks and Atom-based entry level desktop PCs. Major OEMs have committed to having systems on the new Intel® Atom™ processors and a new companion chipset available within the next few weeks. The newest Intel Atom platform for netbooks consists of a new Intel® Atom™ processor, the N450, and a new low-power Intel® NM10 Express Chipset. For entry level desktop PCs, it consists of either the Intel® Atom™ processor D410 or the dual core D510, also paired with the Intel® NM10 Express Chipset. The Atom processor was designed from the ground up for small devices and low power, and remains Intel's smallest chip, built on the company's 45nm high-k metal gate manufacturing process. The overall package, including chipset, just got smaller due to the increasing integration and 45nm manufacturing, which means smaller, more compact system designs, lower costs for OEMs and improved performance. Intel continues to see broad industry support for the Atom platform as netbooks in particular have been hot sellers during a recessionary year due to their affordability, function and small size (7-10.2" screens). 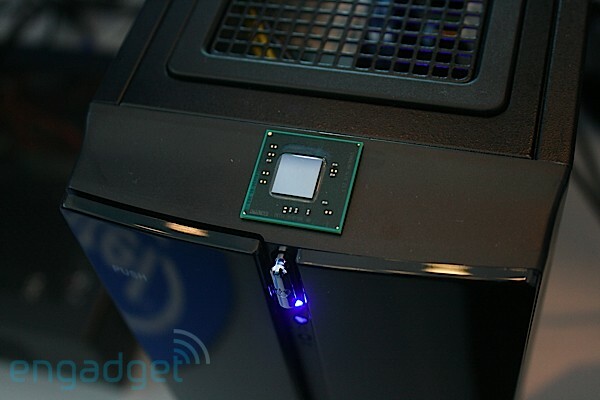 Additionally, Intel is expecting to see broad channel adoption for Atom in a variety of small form factor entry-level desktop PCs at low price points, including ultra-small designs (less than 1-litre chassis), fanless designs, and low-cost all-in-one designs. Since Intel announced the first Atom processors for netbooks and entry-level desktop PCs in June 2008, the market has expanded rapidly. Since introduction, Intel has shipped over 40 million Atom chips for netbooks to every major OEM around the world. In the same timeframe, netbooks ramped faster and sold more units than Apple's iPhone or the Nintendo Wii. * According to ABI Research, total Atom shipments for all segments are expected to continue to grow into the 100s of millions by 2011. * Intel is not letting up, offering the next-generation platform for OEMs to continue to innovate around. "The Intel Atom processor has fueled an entirely new category of computing over the last year and a half and we think the growth will continue for devices like netbooks and entry-level PCs built around basic computing and Internet usage models," said Mooly Eden, Intel corporate vice president and general manager of Intel's PC Client Group. "We're excited to be delivering the next-generation Atom platform and working across the industry as we head into a second phase of growth, powering innovative new system designs with better performance, smaller footprints and better battery life." Intel has over 80 design wins to-date for the new Atom platform from such leading OEMs as ASUS, Acer, Lenovo, Dell, MSI, Toshiba, Samsung and Fujitsu. While the bulk of the systems will feature the new Windows 7* Starter or Home Basic operating system, consumers will have a choice when it comes to selecting an operating system, with some OEMs offering MoblinTM Linux v2 as an alternative for customers who desire a customizable and differentiated user interface. Worldwide netbook shipments by telecommunications companies such as T-Mobile, Vodafone, Orange and others are also growing and expected to fuel another round of expansion. Intel has been working closely with mobile operators and modem vendors to advance 3G capabilities in netbooks in established and emerging markets. To-date approximately a dozen service providers offer netbooks in various markets, and the numbers are expected to grow with the newest platform. One of the most significant features of the new platform is the integration of memory controller and graphics into the CPU, a first in the industry on x-86 chips. That means two chips (CPU+chipset) instead of the previous three (CPU, chipset, I/O controller hub), a lower TDP, and substantial reductions in cost, overall footprint and power. The netbook platform features a 20 percent improvement in average power and a smaller package size over the previous Atom platform. This translates into smaller and more compact system designs and longer battery life. Because of the integration, the total footprint for the netbook platform has decreased by approximately 60 percent. For entry level desktop PCs, it's a nearly 70 percent reduction in footprint and about 50 percent lower TDP than the previous generation. The N450 is a single core Atom processor with 512k of L2 cache and a 7 watt total kit TDP including chipset. The D410 for entry-level desktop PCs is a single-core Atom processor with 512k of L2 cache and a 12-watt total kit TDP including chipset, and the D510 for entry-level desktop PCs is a dual core Atom processor with 1meg L2 cache and a 15-watt total kit TDP including chipset. The new chips all run at 1.66GHz. Pricing and availability will be announced in January as systems become available from OEMs.